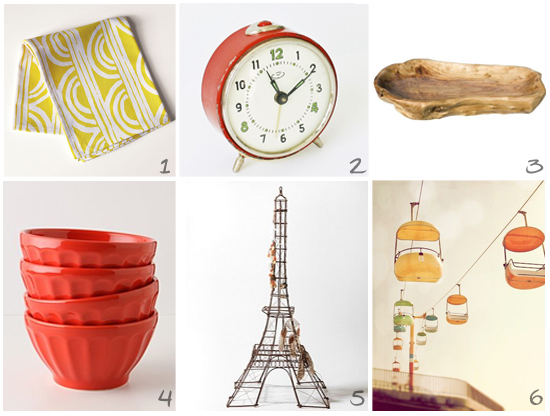 Another Monday has arrived and I hope you like this weeks fabulous finds! I was particularly excited about the vintage alarm clock I found on Etsy, and if you follow the link you will find that the seller actually has a variety of vintage clocks and watches that are equally fun! Well this week I have something fun to look forward to...my husband and I will be celebrating our 5 year anniversary on Friday! I can't believe 5 years has already gone by, it feels like we just got married a couple months ago! Hopefully we will be doing something fun...we are sort of last minute planners if you can't tell. Anyone else doing something exciting this week? oh man, i need all of these. i especially love the #6 picture! The picture is really cool!! !